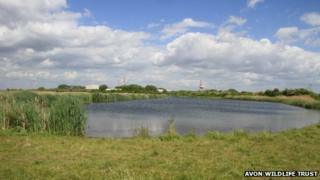 Avon Wildlife Trust has been criticised by people living next to a nature reserve for not being transparent with how it spends its money. Residents of more than 2,000 houses on the Port Marine site at Portishead pay £70 each year for the upkeep of the Portbury Wharf Nature Reserve. Residents say they have not been told what the money is being used for or seen evidence of it being used. The company which collects the levy said communication had been "poor". But a wildlife trust spokesman said it operated with "the utmost transparency". Arthur Terry, director of Port Marine Management Ltd (PMML), the company which collects the levy and manages the funds, said: "We recognise that the flow of information has been pretty poor up to date and we're working to address that. "We hope to start that with our AGM on the 10 July. Planning consent for the housing development was only granted by North Somerset Council on condition the developers designated a nature reserve on the land next to the development. An annual fee, initially of £35 and later increased to £70, is charged by the developer. About £300,000 has been raised through the levy so far, Mr Terry said. A spokesperson for the Avon Wildlife Trust said: "This matter will form part of the Port Marine Management Ltd (PMML) AGM which will be held on 10 July. "The residents have been notified of this. "Avon Wildlife Trust has always operated with the utmost transparency and the financial report is scrutinised by auditors each year and a certificate sent to PMML Board. "We will always be open to scrutiny on this project." Portbury Wharf, a 117 acre (47 ha) nature reserve next to the Severn Estuary between Portishead and Royal Portbury Dock, is a feeding ground for thousands of birds.